Wow! Adventure movies are rarely this inept. Just when you thought that the mountain climbing action movie genre couldn't produce worse examples than K2 or Cliffhanger, along comes Vertical Limit, and makes you beg for another dose of Sylvester Stallone grimacing in the snow. The opening of Verical Limit is almost an exact carbon copy of Cliffhanger, where are hero(s) are having a nice excursion of mountain climbing that results in the accidental plummeting death of a loved one. In this case our heros are brother-sister climbing dynamos, played by Chris O'Donnell and Robin Tunney, and the newly departed loved one is their beloved dad. Jump ahead a few years and Tunney has funnelled her grief into becoming a world-reknowned climbing guide while O'Donnell has given up the sport to become a photographer for National Geographic (?!). Enter Bill Paxton as a multi-millionaire who gathers a climbing group together, which includes Tunney and Nicolas Lea (Krycek for "The X-Files"), to climb to the summit of K2 so he can wave to a passing jet as part of a publicity stunt for his new airline. Despite warnings of bad weather, Paxton and crew climb anyway, and of course there is an avalanche, and of course everyone is killed except for Paxton, Tunney and Lea, who plummet into an ice-cave and are trapped there while the ice and snow cover the cave over. It's now up to O'Donnell to save his sister!!! 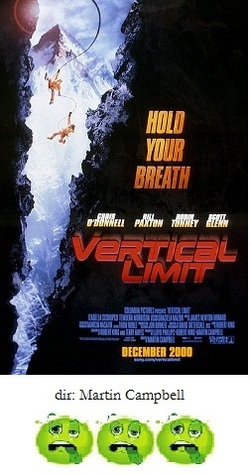 Everything about Vertical Limit is equal parts laughable and ludicrous. O'Donnell gathers a rag-tag climbing group to help with the rescue mission. Since he is able to communicate with Tunney through morse-code over walkie-talkies, he knows they are trapped in the cave. With the help of the Pakistani army he gathers a supply of nitro-glycerin (!!) which every climber must strap to their backs to carry up the mountain. Adventure naturally ensues. Among the rescuers is a mixed bag of one woman, one Pakistani, 2 Australian surfer dude types who provide the feeble attempts at comic relief, and Scott Glenn, a mountain man who has searched for the body of his dead wife on the mountains for years and secretly blames Paxton for her demise. Now it is made perfectly clear that the nitro is extremely unstable, and that they must keep it as still as possible or else they will be blown sky high. However, constantly, the characters are thrown over cliffs, escape near deadly avalanches, jump from high altitudes, slide down hills, fall, or are otherwise thrown and tossed about like rag dolls every few seconds or so. You wonder when the stuff will actually explode. It never does except for when the sun shines on a leaking canister at one point. Convenient plot twist, no? While all of this is going on ad nauseaum, Paxton, Tunney and Lea remain trapped in the cave and begin suffering from pulmonary edema and time is running out. The elements are here to make a gripping adventure story, but the gigantic lapses in logic and the laughable plot developments truly defy belief. Not only do we have the rule bending, non-exploding-until-the-script-says-so nitro, there is also the fact that, although the three trapped characters are in a sub-zero degree ice-cave, we never see their breath...yup, must be reeeeal cold down there. The choppy editing has characters disappear and reappear without explanation; there are bad blue-screen effects with phony looking rock faces, and the avalance is edited in such a way that it doesn't seem to be even occuring on the same mountain, let alone right in front of several of characters. The laughable discovery of Glenn's wife's body, and a groan-inducing ending, which copies the opening scene of the film only to give O'Donnell yet another moral dillema to make the audience suffer through. Action movies almost always depend of some set-pieces which are illogical and impossible, that's just part of the genre, but in the cases of movies like Die Hard and Raiders of the Lost Ark etc., the action is so well-done, you watch breathlessly and ignore such fallacies. However, movies like Vertical Limit whose whole adventure plot depends on such ridiculous scenarios, every single impossibility flashes like a neon sign, impossible to ignore. The "Aw, c'mon!!!" factor of Verical Limit is huge indeed.